I have to admit, I have a little bit of an obsession when it comes to prams and pushchairs, I've had quite a few for my son ever since he was born and I love trying out different makes and models - as does my mother, I must have inherited the obsession from her! We were recently given the chance to try out and review the Graco Evo XT Pushchair and once it arrived I couldn't wait to get out and about with my boy in it. The pushchair parts arrived in one box and although no instructions came with our box we were able to put it together easily in a matter of minutes. Every part of the pushchair clicks into place which is absolutely fantastic because lets be honest, who can be bothered faffing about trying to put things together? Being completely honest, the fact that we were able to put the pushchair together without any instructions whatsoever just goes to show how simple it is to put together. I was really impressed with how the pushchair looked. It's sturdy and well built but not bulky, it actually looks very slimline whilst you're pushing it, meaning it's perfect for taking shopping, etc. It's also a fantastic outdoor pushchair as it sports large, puncture resistant wheels which come with shock absorbers, a huge basket for storing everything you need, an adjustable handle, hood - with no click sounds to wake sleeping children up and it also comes with a large raincover, mosquito net and warm, cosy footmuff for the colder weather. Tyler Lee is a very tall two and a half year old and he fits in the pushchair just fine. He loves the addition of the bar on the front of the pushchair as he loves to lean on it and look out when we're out walking. He even asks for the pushchair to be up in our sitting room to sit in whilst he's watching television, he seriously loves it and finds it very comfy. The pushchair is suitable from birth and can recline fully. It also features a a sturdy harness which can be adjusted to the height and age of your child. I love the Tyler Lee is able to place his feet on the footrest as we walk along and that it's a suitable distance from the ground because in other pushchairs he's just too tall and drags his feet on the ground. The Graco Evo XT can be positioned as a forward or parent facing pushchair, I have it forward facing as my boy likes to look out at the world around him as we walk. There are ten seating positions available with this pushchair when it is used as part of a travel system with the Graco XT Travelcot and Graco Snugsafe Car Seat - each are sold separately to the pushchair. I would highly recommend this pushchair to outdoor lovers like ourselves, it really is such a great all-terrain pushchair and believe me, I've tried it out on every surface imaginable! It glides through grass, it stable on stony paths and is also perfect on old country roads, concrete and footpaths. My only bug bear is that it's a bit hard to maneuver up on kerbs which is a bit of a pain if you've walked to the shops and are struggling to get it up on footpaths. I really love the basket on this pushchair, it's such a generous size and is perfect for carrying everything we need for our outdoor adventures. As you can see I have my large camera bag, Tyler Lee's bag and our picnic bag and still have plenty of room at the back of the basket. I also love how simple it is to put up and down this pushchair. You simply slide the lever on the handle and push the large button underneath this and the pushchair collapses. You just pull it up and out to put up too, it's so easy and as I said at the beginning of this post this pushchair really is faff free! The Evo XT is made of very sturdy materials and is of great quality. The hood is great as it has no clicking sound which putting it back and forth - something which annoys parents when it comes to other pushchairs, making the Evo XT a perfect choice for those who have light-sleeping babies and toddlers. 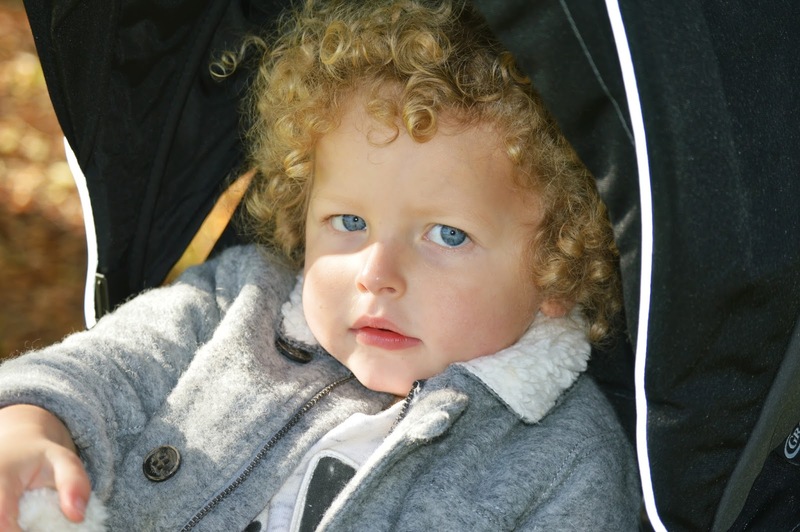 Overall, we love this pushchair, having it with us on our walks and outdoor adventures means that Tyler Lee actually enjoys being in the pushchair. He loves sitting in it and it's great to have so much space for all the things we need when out and about. The Graco Evo XT Pushchair is exclusive to Mothercare stores across the UK and is £379.99. *We were sent the Graco Evo XT Pushchair for the purposes of this review, however, all thoughts and opinions expressed in this post are 100% our own. Oh Fiona, Tyler Lee is just too cute! Those blonde curls are so gorgeous. The pushchair sounds perfect for your lifestyle, I can't believe how sturdy those wheels look - they're like mini mountain biking wheels! Also beautiful photos as always, I love the autumnal colours. This looks like a great buggy - the bar at the front is a nice touch too, and that basket is perfect for shopping. A great combo if you're sometimes heading off-road and sometimes in town too. That is a seriously large basket. I like the way there's now so many buggies with inflatable tyres, because when I was looking there were so few options around. This looks like a fantastic pushchair and it is a brand that I haven't come across before. I like how it looks so modern with a streamlined finish and it is perfect for Tyler too.